Plant Protein Blend (69%) [Brown Rice Protein, Pea Protein Isolate, Hemp Protein], Natural Flavourings, Wholefood Blend (7.5%) [Flaxseed (3.5%), Pumpkin Powder, Sweet Potato Powder, Quinoa, Tiger Nut Powder], Greens Blend (4%) [Organic Spirulina, Organic Alfalfa Leaf Powder, Organic Chlorella (Broken Cell Wall), Broccoli Powder, Kale Powder, Spinach Leaf Extract], Fruit and Berry Blend (2.5%) [Acai Berry Powder, Baobab Fruit Powder, Goji Berry Powder, Pomegranate Powder, Raspberry Fruit Powder], Thickener (Xanthan Gum), Vegan Coconut Oil Powder, Green Tea Extract, Matcha Tea Powder, Yerba Mate Tea Powder, Grapeseed Extract, Green Co¬ffee Bean Extract, Natural Sweetener (Thaumatin). 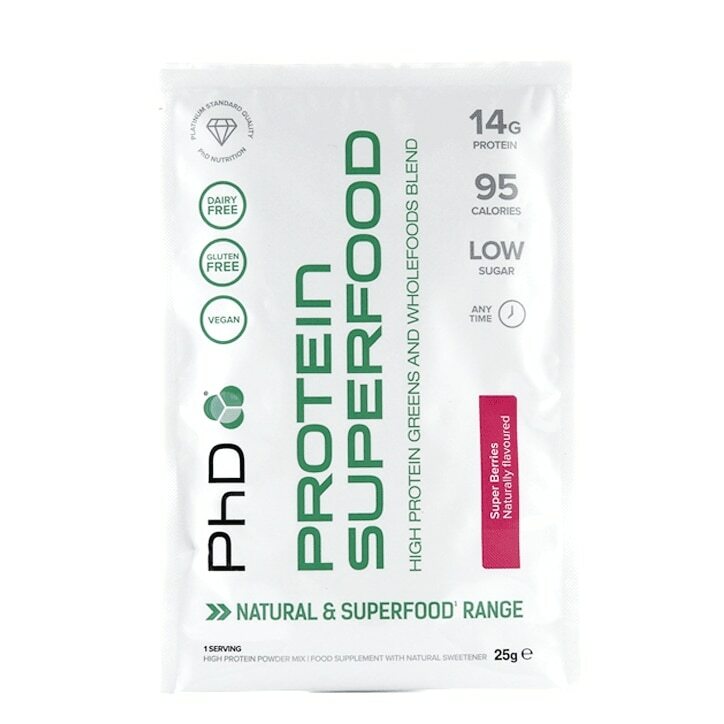 PhD Protein Superfood Berry is rated 3.6 out of 5 by 18. Rated 1 out of 5 by Crackle from Dire Gritty, sweet to the point of being stomach turning and the most awful artificial flavour I have ever tasted. A vile product that I would advise anyone to avoid.